It isn’t often that US think tanks put pen to paper about Australian strategic and defence policy. All the more reason, then, for us to look closely at those reports that are published, just to see how our American friends interpret the diverse range of signals that emit from both official and non-official sources here. A recent report by the US Center for Strategic and Budgetary Assessments (CSBA) is noteworthy in this respect. The report bears the bold title, ‘Gateway to the Indo-Pacific: Australian Defense Strategy and the Future of the Australia-U.S. Alliance ’, and two of its three authors (Jim Thomas and Zack Cooper) have previous government experience. So readers might reasonably expect to find here a carefully nuanced assessment of the many tangled threads of Australian strategic thinking, especially those that apply to the future of the ANZUS alliance. But I must say I was disappointed in my expectations. Much of the report is narrow and operational in its focus, and Australian strategic policy appears as a caricature of itself. I think the report places too much emphasis, right at the start, on a judgment that shifts in geopolitics have moved Australia from ‘down under’ to ‘top-centre’ in terms of geopolitical importance. This thesis has previously been associated with the work of Iskander Rehman, the CSBA report’s third author. (His report for the Transatlantic Academy in May 2011  (PDF) has the same central themes.) The thesis wasn’t true when it was first advanced and hasn’t become more so with the passage of time. Australia doesn’t become ‘top-centre’ under the likely shifts in geopolitical power, even allowing for a south-westerly drift of the regional balance point in Asia—strategic weight will remain concentrated in the northern hemisphere. But starting from this (false) position leads the authors to overbid their hand on Australia’s future. Australia is depicted as a ‘gatekeeper to the Indo-Pacific commons’, a watch keeper over contested waters, and a central agent in the preservation of crisis stability in Asia. Those are heady claims, and it’s not obvious we could fulfil them. On the first, for example, most major players have direct access to large chunks of the Indo-Pacific, and we would struggle to control any gate to the rest of the commons through which a major (and nuclear-armed) power was determined to go. 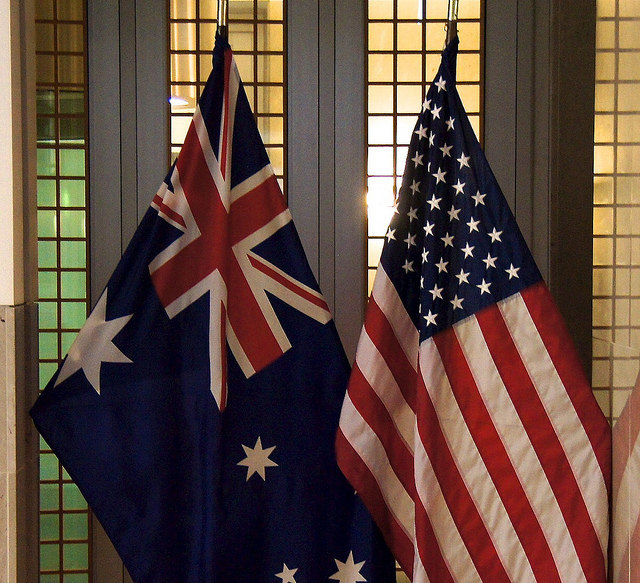 The report’s coverage of recent Australian strategic debates is necessarily constricted to how some of the key players in the Australian strategic community think about the future of ANZUS. Even here I’m not sure they’ve accurately set up the spectrum (between alliance maximalists, alliance minimalists, and incrementalists). Essentially, Hugh White is depicted as a minimalist, Ross Babbage as a maximalist, and Ben Schreer as an incrementalist. Personally, I don’t think the Australian strategic debate focuses much upon ANZUS—that’s typically a point of convergence rather than divergence within the community. The real debate is about something much broader—the shape of the future strategic order in Asia. That’s because Australia’s central strategy is about order-building, not hedging. a ‘Peripheral Launchpad’, from which to launch maritime interception operations in the Indian Ocean in order to influence the outcome of conflict in the western Pacific. Elements of each of those roles might well form part of Australian defence policy in the 21st century, but without quite the emphasis the report suggests here. The operational roles only make sense within a grander strategic picture—and for Canberra, that’s the picture of building a stronger regional order in Asia. Moreover, the significance of most of the roles is diluted once we reverse the ‘top-centre’ fallacy. Yes, there’s merit in Australia being a supportive sanctuary for US forces, for example. But its prime claim to being a sanctuary has to do with remoteness, and sadly geographical distance is the same when you’re travelling in the other direction. The report subsequently moves on to the topic of capabilities and defence budgets, areas where I wouldn’t venture to tread. So let me conclude by saying that I think the report overstates one of its core assumptions—the assumption that Australia is a critical geopolitical hinge of the new world order. True, Australia is strategically more significant than it was, and is likely to become more so. In that changing strategic context, ANZUS will likely become a more important alliance both for us and the Americans in the 21st century than it was in the 20th. Indeed, I’ve written here before  that we should be looking to do more with ANZUS, including by using the treaty’s under-used Article 8 to reach out to other players. But while I commend the CSBA authors for their exploration of possible alliance operational roles, I think we need to explore the future strategic role of ANZUS more closely. Rod Lyon is a non-residential fellow at ASPI and an adjunct associate professor at the Griffith Asia Institute. Image courtesy of Flickr user Ted Eytan .